Dr Jun Yan a molecular biologist, currently working in the field of neurological diseases. Dr Yan's research interests are cell signal transduction pathways invoved in mechanisms of the disease development. 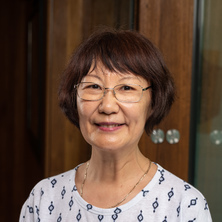 Dr Jun Yan completed her postgraduate study at The University of Queensland, after which she undertook a postdoctoral position in Experimental Oncology laboratory in Department of Patholody, UQ and worked on Ras / Raf signalling pathway. In 2001 she joined the Neuroimmunology Research group in Department of Medicine, UQ and works on neurological diseases, including autoimmune disease multiple sclerosis (MS), ischaemic stroke and amyotrophic lateral sclerosis (ALS) . She has been investigating NF-kB signal transduction pathway in MS and ALS, and cell immune responese to ischaemic stroke. Do PLP1 mutations found in MS patients lead to the unfolded protein response and apoptosis of PLP-expressing cells? Degnan, Bernard M., Yan, Jun and Lavin, Martin F. (1998) Evidence of multiple transcription initiation and termination sites within the rDNA intergenic spacer and rRNA readthrough transcription in the urochordate Herdmania curvata. Molecular Marine Biology And Biotechnology, 7 4: 294-302. Khanna, KK, Beamish, H, Yan, J, Hobson, K, Williams, R, Dunn, I and Lavin, MF (1995) Nature of G1/s Cell-Cycle Checkpoint Defect in Ataxia-Telangiectasia. Oncogene, 11 4: 609-618.
rRNA genes from the lower chordate Herdmania momus; structural similarity with higher eukaryotes. Qi, ZH, Yan, J and Zhu, QL (1989) Studies On the Structure of Hbv Dna. Science in China Series B-Chemistry, 32 11: 1318-1328. Qi, ZH, Yan, J, Xiong, WJ, Yuan, JG, Song, S, Xue, CQ and Cai, LW (1989) Determination of the Complete Nucleotide-Sequence of Hbv Adr Nc-1 Dna. Science in China Series B-Chemistry, 32 9: 1082-1086.